R&D in media-related technologies including multimedia, information retrieval, computer vision, and the semantic web is experimenting on a variety of computational tools that, if sufficiently matured, could support many novel activities that are not practiced today. Interactive technology demonstration systems produced typically at the end of their projects show great potential for taking advantage of technological possibilities. These demo systems or “demonstrators” are, even if crude or farfetched, a significant manifestation of the technologists’ visions in transforming emerging technologies into novel usage scenarios and applications. In this paper, we reflect on design processes and crucial design decisions made while designing some successful, web-based interactive demonstrators developed by the authors. We identify methodological issues in applying today’s requirement-driven usability engineering method to designing this type of novel applications and solicit a clearer distinction between designing mainstream applications and designing novel applications. More solution-oriented approaches leveraging design thinking are required, and more pragmatic evaluation criteria is needed that assess the role of the system in exploiting the technological possibilities to provoke further brainstorming and discussion. Such an approach will support a more efficient channelling of the technology-to-application transformation which are becoming increasingly crucial in today’s context of rich technological possibilities. Lee, H, Mohamad Ali, N, & Hardman, L. (2013). 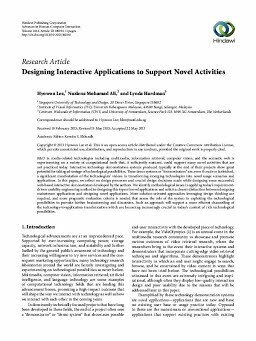 Designing Interactive Applications to Support Novel Activities. Advances in Human-Computer Interaction, 2013.